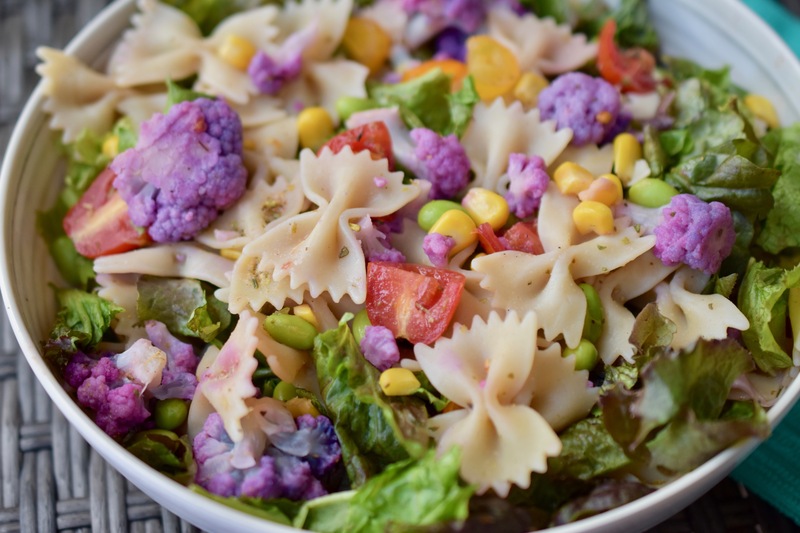 This salad is so beautiful and colorful; purple, red, yellow, orange and green. The proverbial colors of the rainbow. I used fresh and frozen veggies, and it has more veggies than pasta. I would say, that is a fresh tasting nutritious pasta salad. Need an idea for lunches for school or work? This salad will meet that need. It makes enough for multiple meals and can be served cold or room temperature (preferably). In a large pot cook farfalle according to package directions. I used Jovial (my favorite brand) and it cooks for 10 minutes. Drain. Rinse with cold water and set aside. Meanwhile, steam cauliflower for about 5 minutes. Long enough that the cauliflower was softened but still has a bite. Rinse with cold water and set aside. In a very large bowl combine all the ingredients and stir thoroughly. Cover and refrigerate for at least an hour. Note: I added greens to this salad when it was served.